Home » Supporting high-potential innovative start-ups » Supporting digital innovation ecosystems: what role for DFIs? When it is properly supported, digital innovation can act as a powerful catalyst for achieving sustainable development goals (SDGs). Innovation dynamics are very important in Africa and play a key role in devising sustainable inclusive solutions tailored to the context of these countries that provide people with access to basic goods and services that are currently of a poor standard, such as energy, education and healthcare. But digital innovation needs to be nurtured in a continent where support structures and seed financing are very rare commodities. In this context, development institutions are in a position to stimulate investment, bolster support structures and support human capital development in specialised areas. The digital transition is a giltedged opportunity to achieve sustainable and inclusive development. Innovative digital apps can provide vulnerable populations with access to essential goods and services. For example, “mobile money” enhances access to financial services, “pay as you go” can facilitate the purchase of such things as solar energy, and “mobile health” can help deploy remote diagnosis solutions inter alia. In many domains, these digital solutions are enabling sectors to develop by leapfrogging some of the stages they had to go through in developed countries. These innovations are frequently deployed by start-ups who have been able to transform the constraints specific to their operating environment into value-creating opportunities. Nevertheless, these successes mask the challenges facing the vast majority of entrepreneurs, particularly in Africa. According to a study carried out by the firm of Roland Berger for Agence française de développement (AFD/Roland Berger, 2017), start-up momentum in Africa is weak when compared with elsewhere. There are only 0.3 start-ups per million people in Sub-Saharan Africa, 9.6 in South Africa, and 1.3 in Morocco – versus 43 in France. This discrepancy is due to the dearth of support structures and seed funding for start-ups. It is during this key phase (diagram opposite) – considered highly risky by investors – that support and seed financing are crucial for transforming an innovative idea into a marketable product. In order to develop and grow, start-ups generally need structures that can partner them in each phase of their development. 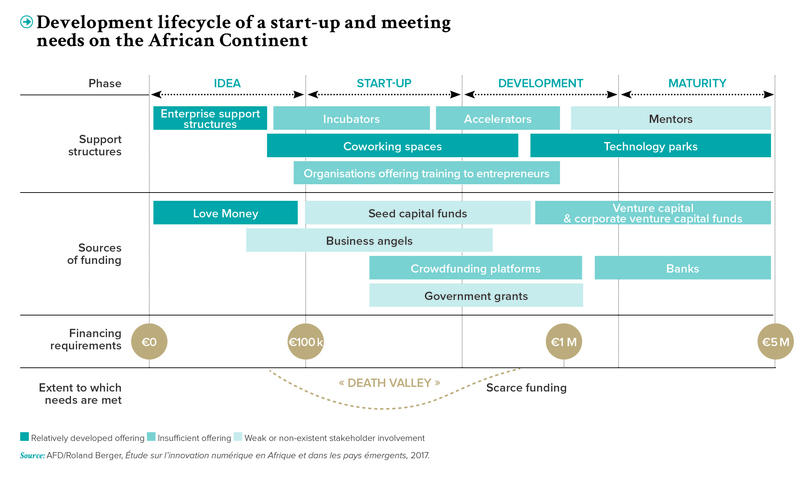 The support structures in question, just like coworking spaces, are gradually emerging across Africa, however the incubators and accelerators that offer more comprehensive support are not nearly up to speed yet. They are struggling to get off the ground due to a lack of both public and private sector support. However, aside from the dearth of support structures, the number one problem facing African entrepreneurs is scarce funding: 87% of project backers consider this to be very difficult to obtain. The collateral required, coupled with the high interest rates charged by African banks are often insurmountable barriers. Alternative sources of finance such as crowdfunding, business angels, venture capital or seed funding remain very limited in their scope and concern very few projects. Private equity in Africa is often focused on growth capital, mostly for well-established SMEs, and specialised seed or venture capital funds are virtually non-existent outside of South Africa. Development institutions can be catalysts here and encourage governments to set up digital investment programmes for example, or spearhead initiatives to finance start-ups and help structure the various stakeholders and initiatives while continuing to strengthen the sector, especially in terms of human resources. South Africa, Nigeria and Kenya absorbed 80.3% of investment, followed by Egypt, Ghana, Morocco and Rwanda. Broadband access and 3G or 4G mobile coverage – which make it possible to distribute digital services – will be one of Africa’s key challenges over the next 10 years. According to the International Telecommunication Union (ITU, 2017), only 22% of Africans currently use the net. As well as boosting network coverage, Africa also needs its own resources – particularly servers – to cut network access costs and develop local content and services that are adapted to the needs of local populations. Investing in digital infrastructure is the first step in placing Africa on the road to more inclusive and sustainable social and economic growth. These capital-intensive projects could be co-financed by development institutions. In addition to developing digital infrastructure, innovation funding needs to be diversified and made more accessible. To be sure, the number of African start-ups that have managed to raise seed funding (for the start-up phase) and venture capital (for the development phase) grew by 17% between 2015 and 2016. They managed to raise US$ 129 million in 2016, of which more than 24% went into fintech startups (i.e., financial technology start-ups). South Africa, Nigeria and Kenya absorbed 80.3% of investment, followed by Egypt, Ghana, Morocco and Rwanda. Nevertheless, the portion of startups that are being funded remains small: only 3.6% of African tech start-ups that looked for seed or venture capital funding in 2015 actually managed to raise any, even though the funding potential should reach US$ 1 billion by 2020 (Partech forecast). Furthermore, the business angels who are present in very small numbers or in an unstructured form only concern very small numbers of projects and crowdfunding is struggling to take off due to an ill-adapted regulatory framework. Better access to funding for African start-ups is therefore a key imperative. As a development institution, ADF needs to support conditions that open up and enhance market attractiveness and financial backers can do this in a number of different ways. 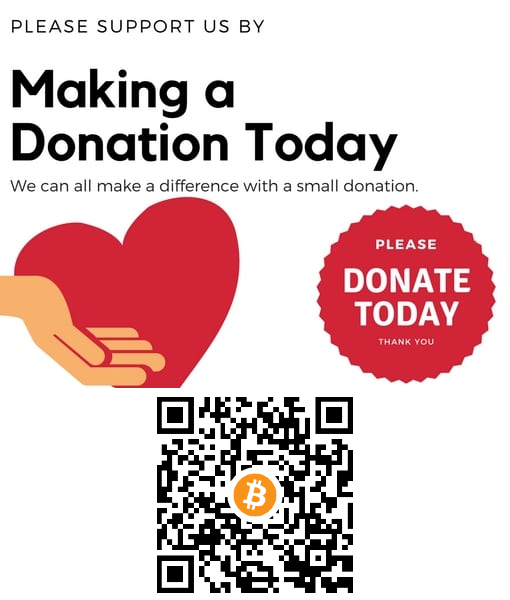 They can for example participate in seed or venture capital funds or encourage investment through risk pooling mechanisms that benefit funds and finance institutions. They can also deploy enterprise support initiatives like interest-free loans, similar to those provided by the Afric’Innov fund supported by AFD. As proof of the dynamism of the sector, numerous innovation initiatives are taking off across the Continent with the backing of a whole host of institutional and private stakeholders and associations. However, these stakeholders, often working alone, are struggling to get start-ups off the ground and it is absolutely essential to bring innovation ecosystems together in order to structure them and consolidate their action. And here again development institutions can be of help by facilitating exchanges and sharing best practices between different players and by structuring networks of mentors and business angels. They can also help create an environment and regulatory framework that is more conducive to enterprise and research. This support, which can take the form of funding or technical assistance, is absolutely indispensable for unlocking the full potential of digital innovation. Human capital development is also essential for digital innovation. By 2025, it is estimated that Africa will need 30,000 IT engineers and 120,000 developers so there is a big need to boost under-graduate expertise in computer technology. Development institutions can help out in a number of ways: supporting higher education institutes that wish to develop enterprise programmes, creating technical learning programmes (i.e., web and mobile development, UX and UI design, data, architecture and cloud computing), or setting up coding schools (similar to French schools such as Simplon, École 42 or WebForce3). A number of institutional funds have launched digital innovation support programmes in Africa: “Boost Africa” (African Development Bank and European Investment Bank), “Startup Catalyst” (World Bank), and “Challenge Funds” (Swedish international development agency). In a similar vein, AFD Group has launched the annual “Digital Africa” awards (box below) which single out African start-ups that have come up with innovative pro-development solutions, and “Fonds Afric’Innov” which gives support to entrepreneurs in the start-up phase. AFD is also throwing its weight behind several operators and stakeholders in development infrastructure and digital solutions and investing in a number of venture capital-type projects through its subsidiary Proparco. The digital economy is one of the few sectors in which Africa has succeeded in bridging the gap with developed countries and African development is now intrinsically bound up with this sector. The digital innovations being deployed by start-ups have transformed business models and value chains while also fostering greater inclusiveness through innovative tailored solutions. Based on its strong market growth potential – e-commerce contributed US$ 18 billion to African GDP in 2013 and this is set to top US$ 300 billion by 2025 – the digital economy is synonymous with hope, particularly for African youth. Partnering digital innovation across the Continent means providing Africa with the resources it needs to tackle economic challenges for years to come. Etudesk (Côte d’Ivoire): Etudesk is an e-learning platform that provides students, job-seekers and workers with businesstype courses that enhance their professional skills. Ville Propre (Morocco): Ville Propre (or Clean City) is a mobile social app that aims to help clean up polluted urban areas and maintain them to the standards expected by local inhabitants. Tuteria (Nigeria): Tuteria is an online platform that puts people wishing to learn into contact with local experts who have been “peer-verified” by their communities. LishaBora (Kenya): LishaBora provides inputs and practices and co-manages products for Kenyan smallholder dairy farmers. This start-up also provides fodder management and general farming services and helps unlock access to bank loans and credit. Volkeno (Senegal): Volkeno is developing a distance learning device for studying new technologies, even when there is no internet connection, for the ultimate purpose of facilitating the professional integration of young people. Agence Française de Développement/Roland Berger, Étude sur l’innovation numérique en Afrique et dans les pays émergents, 2017. Union internationale des télécommunications, Facts and Figures, 2017.